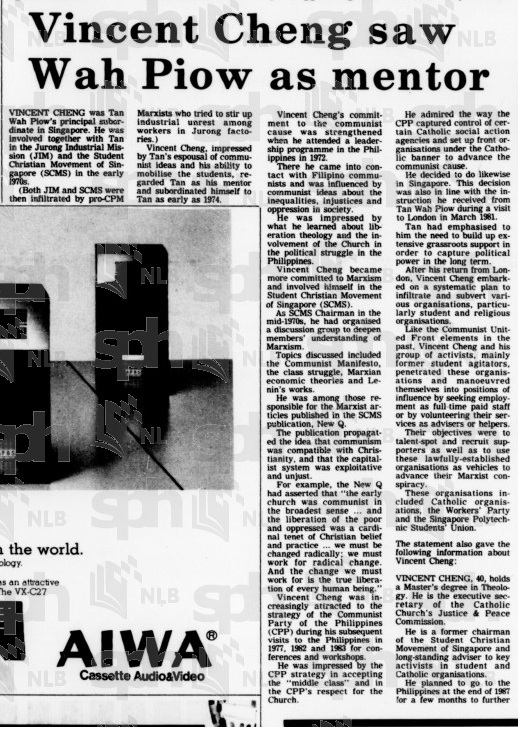 The relationship between Tan Wah Piow (TWP) and Vincent Cheng (VC) was kindled in 1972 when the younger TWP, then a University of Singapore student joined the Jurong Industrial Mission (JIM). VC had been a salaried staff of JIM since 1971. In fact, TWP's involvement in JIM changed his life for it was also where he met his current wife Chew Beng Lan (CBL). CBL, a salaried staff of JIM since 1969, later left for London to be with TWP when he decided to exile himself after being drafted for NS. TWP and CBL now reside in London with a son and although they have not set foot in Singapore since 1974, their son has been to Singapore according to this report. 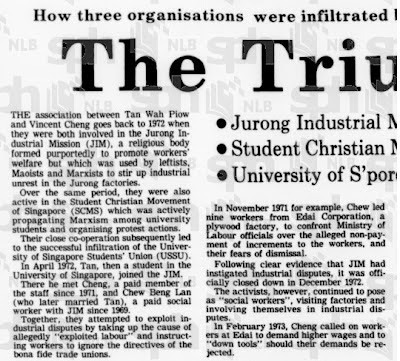 JIM was a Catholic body formed to promote workers’ welfare but was allegedly used by leftists and Marxists to stir up industrial unrests in the Jurong factories. During the same period, the trio of TWP, VC and CBL were also active in Student Christian Movement of Singapore (SCMS) which was actively propagating Marxism among university students and organising protests actions. JIM was closed in December 1972 after it had been involved in the agitation of industrial disputes where they ordered workers to ignore the directives of union leaders. Despite being closed down, VC continued his work as a 'social worker' with the backing of radical SCMS members. In May 1973, a labour dispute at the Singapore Gulf Plastics culminated in a demonstration outside the American Embassy. 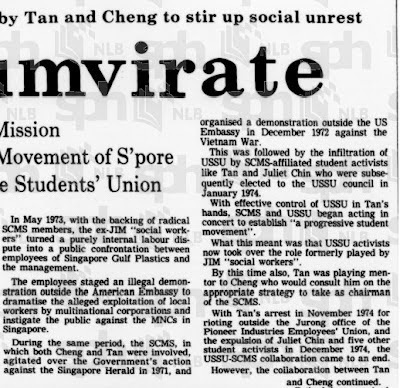 Besides labour issues, both TWP and VC were involved in agitations over the censure of the newspaper Singapore Herald in 1971 and a protest in December 1972 outside the US Embassy against the Vietnam War. 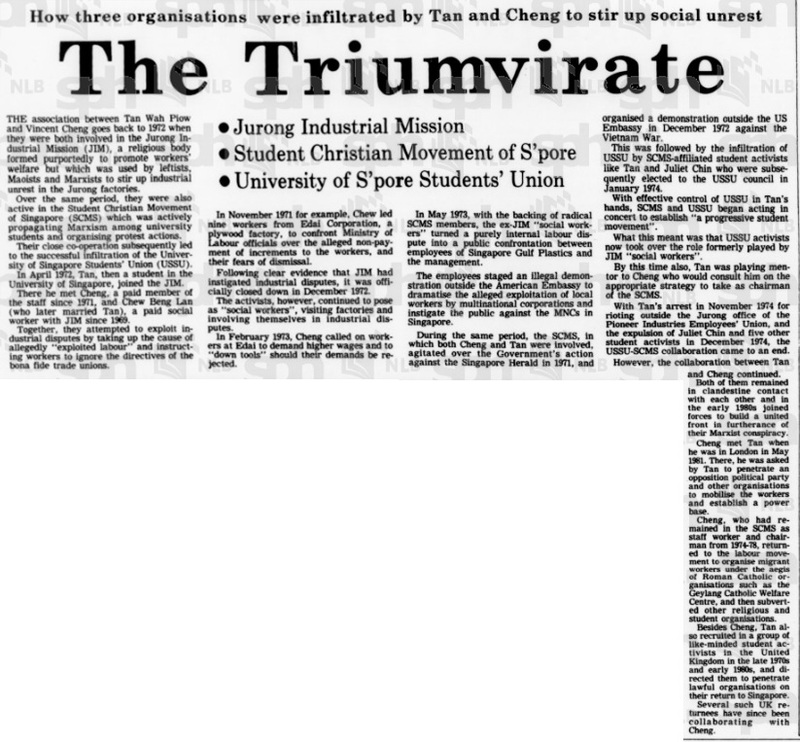 The close cooperation of TWP and VC subsequently led to the successful infiltration of the University of Singapore Students’ Union (USSU) where SCMS student activists, including Juliet Chin, were elected to the USSU Council in January 1974. However, this was short-lived when TWP was imprisoned in Novemeber 1974 for the PIEU case while many key USSU activists were expelled. VC, however, remained in the SCMS as a staff worker and chairman (1974-1978). As SCMS chairman in the mid-1970s, he had organised a discussion group to deepen members’ understanding of Marxism. Topics discussed include Communist Manifesto, the class struggle, Marxian economic theories and Lenin’s works. The publication called the New Q propagated the idea that communism is compatible with Christianity, and that the capital system is exploitative and unjust. Despite being separated by the oceans, TWP and VC remained in contact with each other and it was charged that in May 1981 when VC visited TWP in London that VC was asked to penetrate a political party and other organisations to mobilise the workers. Earlier in Mar 1981, VC informed that his attempts to infiltrate the trade unions failed because of “tight government control”. Although older in age, VC apparently looked up to TWP as the latter displayed the ability of mass mobilisation and a keen understanding of Communist doctrine. VC was also increasingly attracted to the strategy of the Communist Party of the Philippines (CPP) as a result of his visits to the Philippines in 1977, 1982 and 1983 for conferences and workshops. He was impressed by the CPP strategy of capturing control of certain Catholic social action agencies to advance the communist cause. 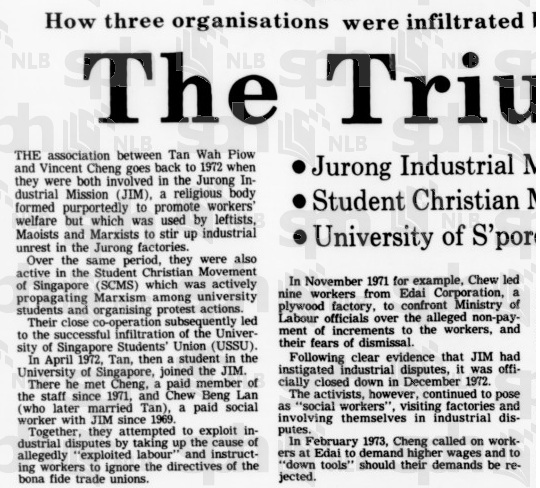 Influenced by CPP and TWP, VC and his group of activists supposedly began to penetrate local student and religious organisations by seeking employment as paid staff or by volunteering their services as advisers or helpers. Their objectives were to talent spot and recruit supporters as well as to use these lawfully-established organisations as vehicles to advance their cause. Do you really believe this?? That Ronald Reagan's administration was supporting the lawyer for a bunch of Marxists?? ?